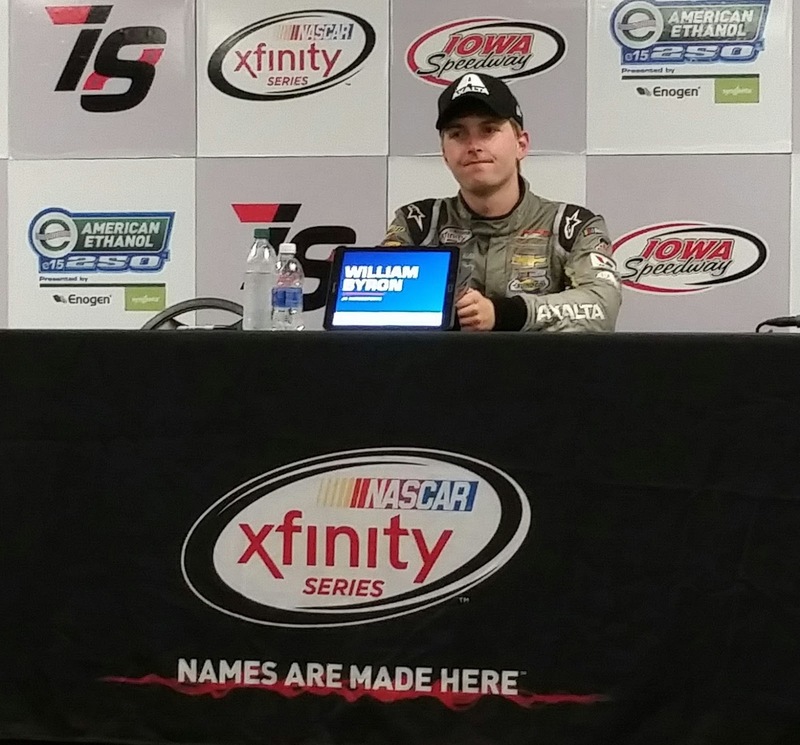 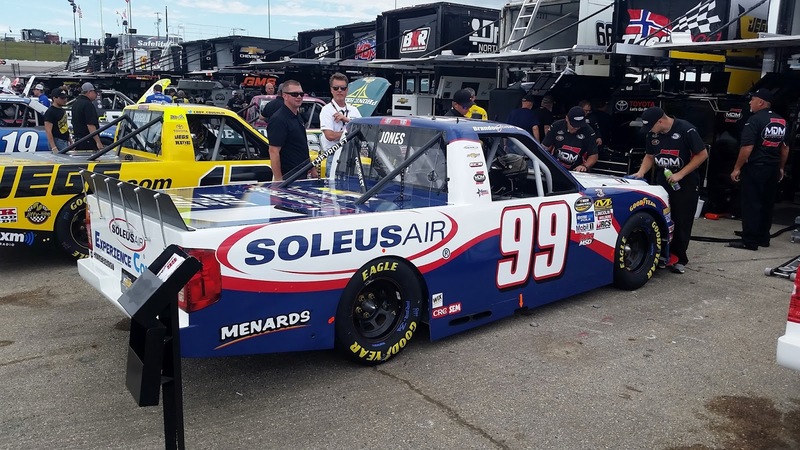 William Byron has already been a winner at Iowa Speedway in the Truck Series, but the young driver added more to his legacy as he won the NASCAR XFINITY SERIES E15 250 Presented by Enogen Saturday at Iowa Speedway. 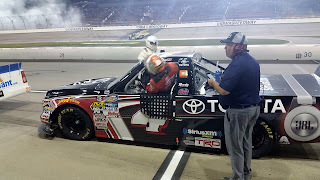 Byron started 6th and was at or near the front a good portion of the race, leading five times for a total of 78 laps. The win was his first in the XFINITY Series in just his 14th carreer start. Byron is also the youngest series winner at Iowa speedway at the age of 19 years, 6 months and 26 days. 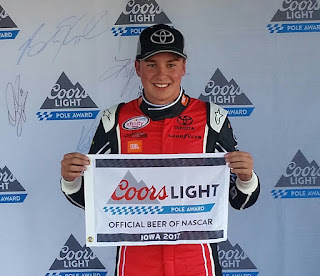 (The previous record was Erik Jones after his win last year at 20 years, 2 months and 0 days.) 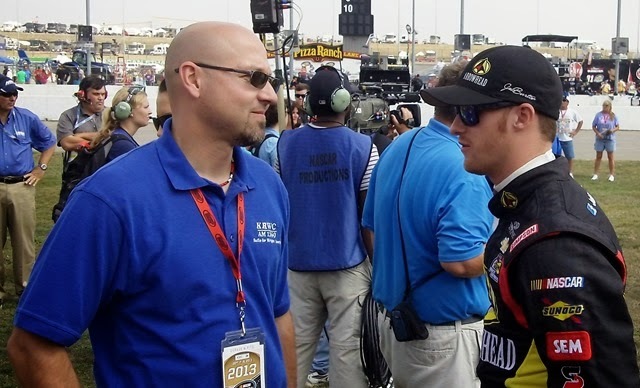 Following the win, Byron took a phone call from owner Rick Hendrick while in Victory Lane. Ryan Sieg finished second, his first top 10 finish in 2017. Sieg started 22nd and a strange combination of the leaders pitting under green late in the race coupled with a caution in the middle of the pit sequence put Sieg in position for a top five finish. 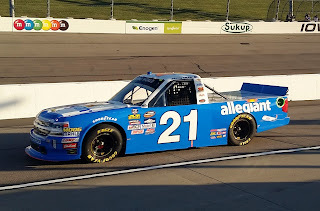 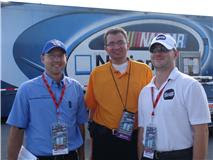 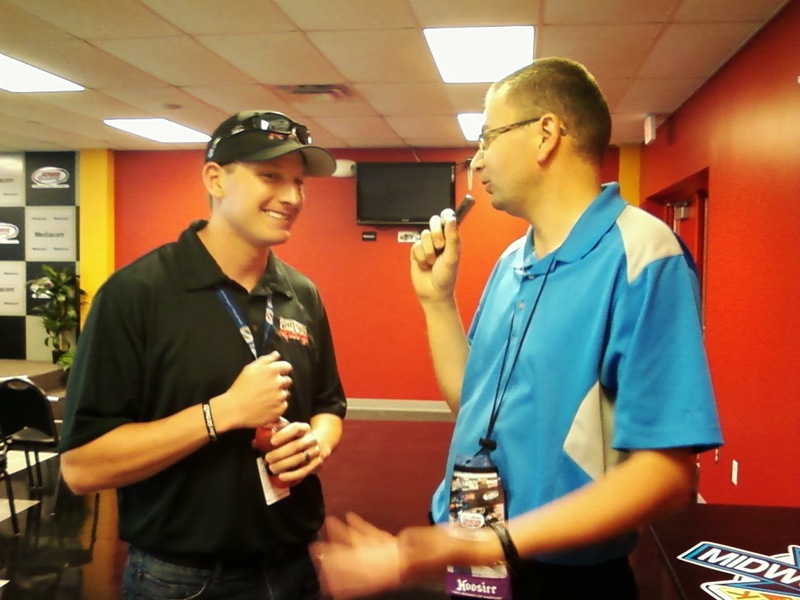 Tyler Reddick moved from a 15th place start to a career best 3rd place finish and first top 10 finish at Iowa Speedway. 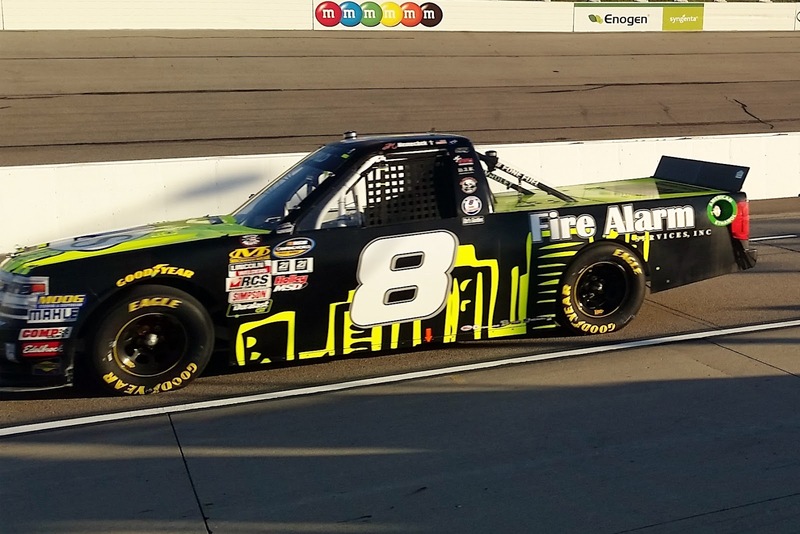 Ross Chastain put himself in position for a good finish when his team worked the strategy to give him a career best 4th place finish. 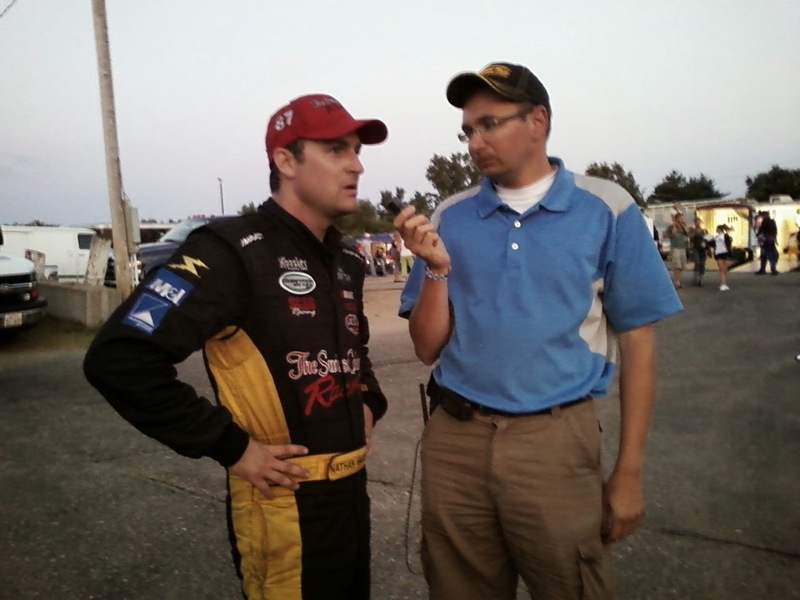 Dakota Armstrong flirted with the lead cars the entire race and was also one of the cars that did not pit under green, which helped him to a 5th place finish. 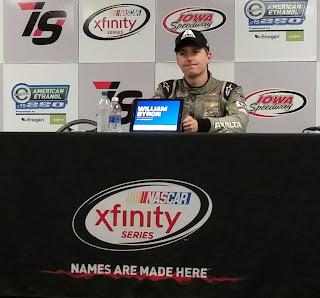 Pole sitter Christopher Bell led 3 times for a race leading 152 laps and was the leader when many of the other top cars pitted under green. 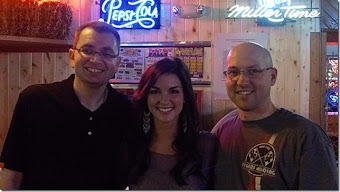 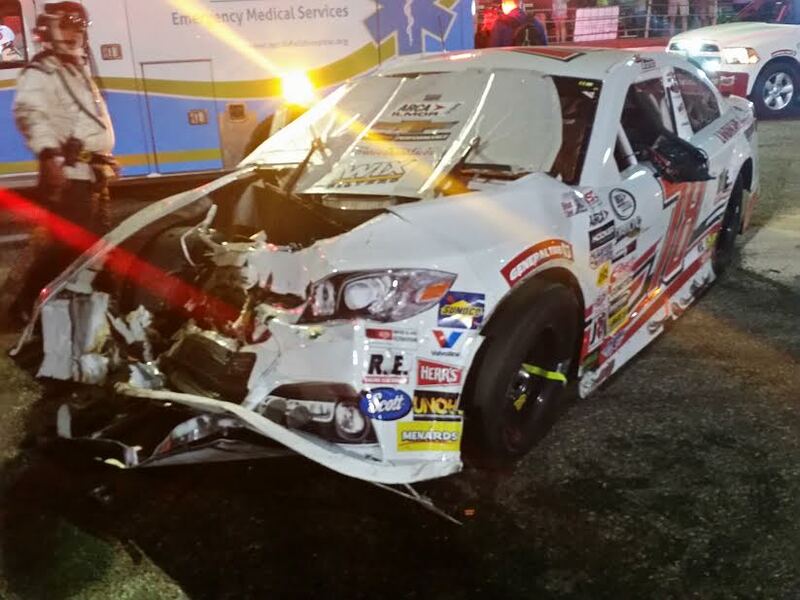 Bell was caught up in a wreck with Ryan Reed and Brennan Poole. 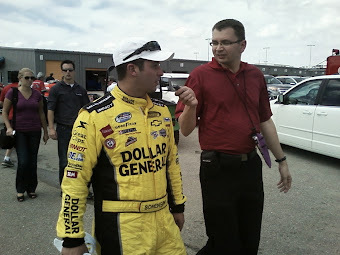 Bell was part of the caution that he was looking for. 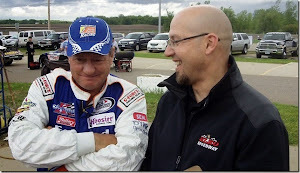 He would finish 16th. 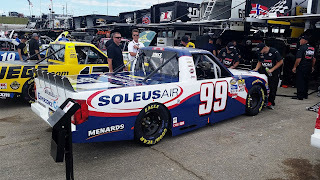 Midwest Late Model star Ty Majeski made his first carreer NASCAR XFINITY SERIES start in the number 60 iRacing.com Ford. Majeski started 10th, but by making some bold moves on the outside, he quickly moved up to fifth. Near the end of the first stage of the race, Majeski slowly began to fade as his tires went away. 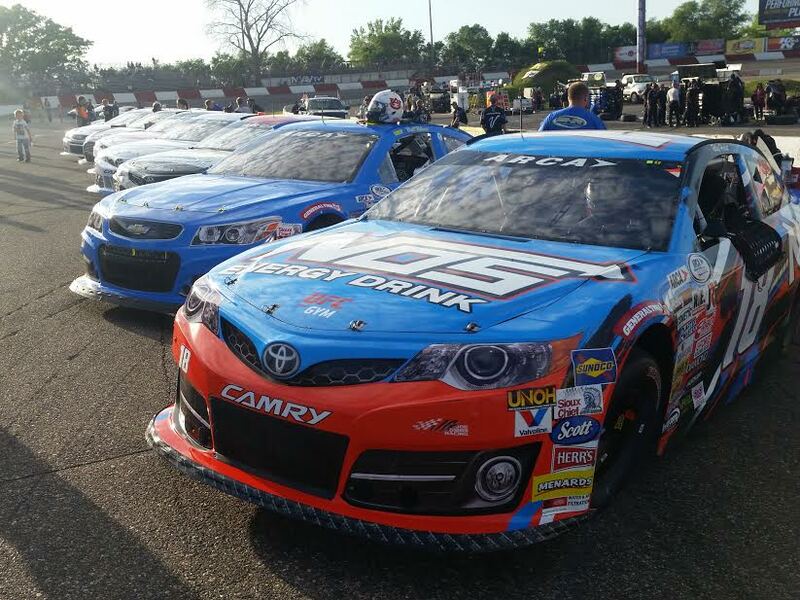 On lap 114, while running in the middle of the pack, Majeski tangled with the already spinning car of Kyle Benjamin. 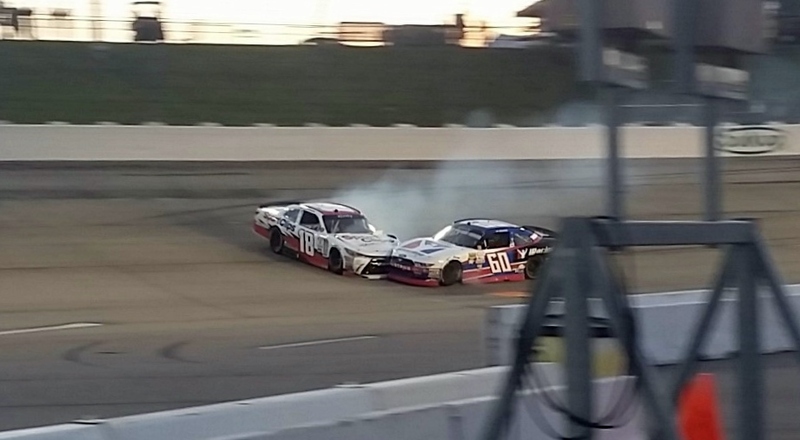 The pair collided hard in turn four and Majeski suffered considerable damage. 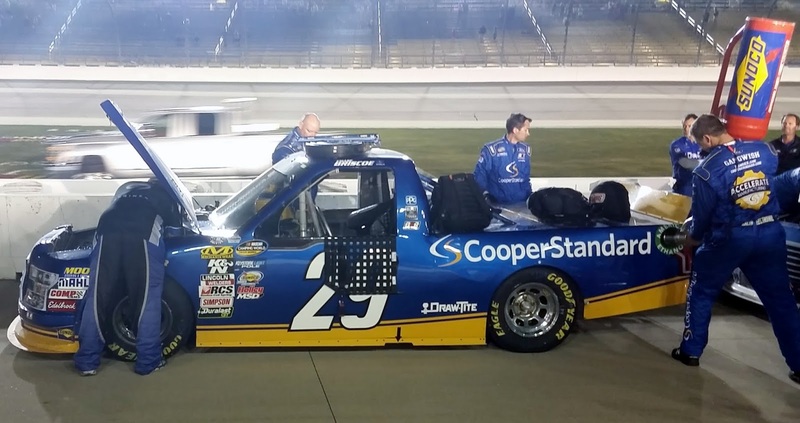 After making several pit stops for repairs, he was able to continue. 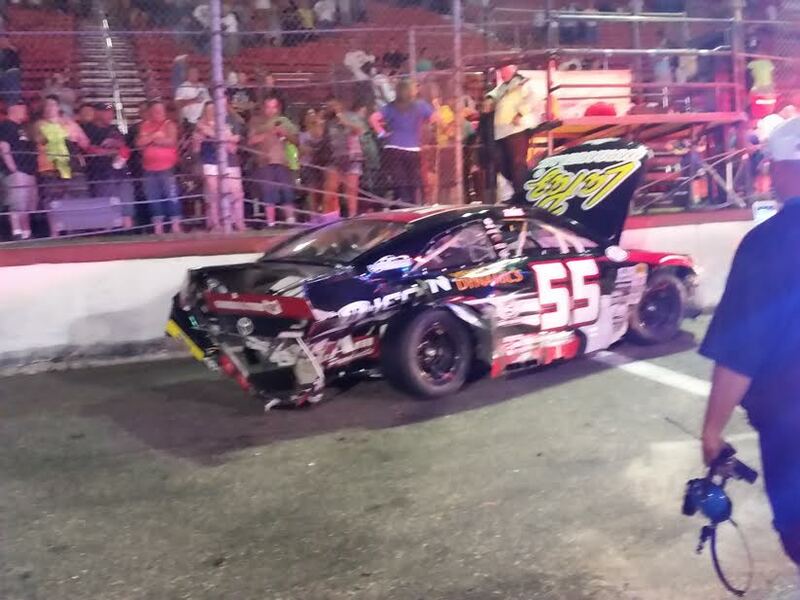 Then on lap 146, Majeski pounded the wall in turn one to bring out the 6th of 9 cautions on the night. 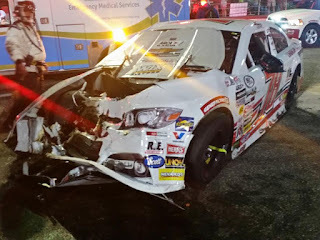 Majeski limped his car back to his pit with heavy damage including a fire on the right front tire, thus ending his night with a disappointing 34th place finish. Due to the impact of the crash, he we examined and released from the infield care center with no injuries. 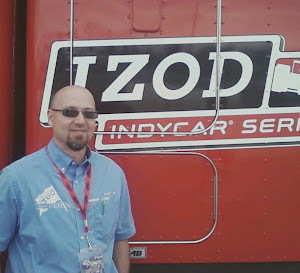 Time of Race: 2 Hrs, 32 Min, 52 sec. 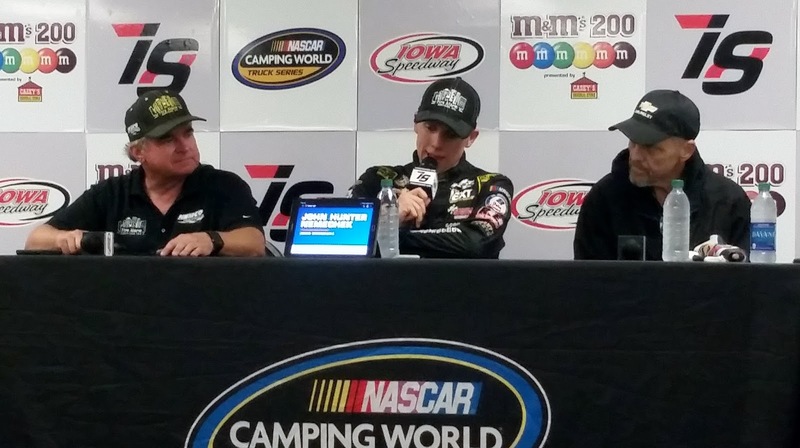 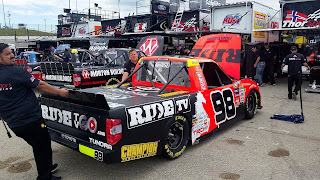 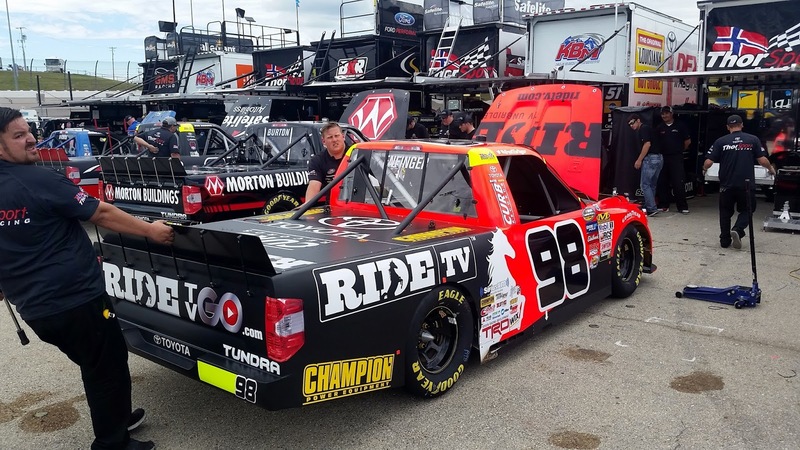 John Hunter Nemechek took the lead with 5 laps remaining and held on to win the NASCAR CAMPINGWORLD TRUCK SERIES M&M's 200 Presented by Casey's General Stores at the Iowa Speedway on Friday June 23rd. The final 6 laps, would be the only ones that Nemechek would lead in the race. Johnny Sauter finished second, leading twice for 72 laps and surrendering the lead on lap 194 after a late restart. 13th starting Brandon Jones finished third and did not lead any laps during the race. 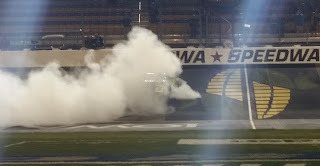 10th starting Grant Enfinger finished 4th. Christopher Bell started second and led once for 99 laps, but a caution before the end of stage 2 got him out of pit sequence and he finished 5th. 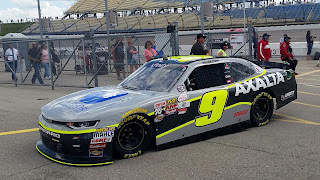 Third starting Chase Briscoe led once for 7 laps and finished 7th. 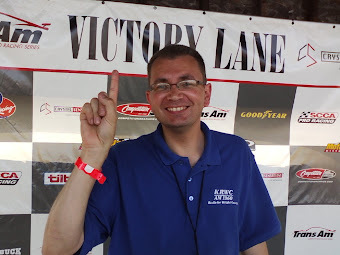 Time of Race: 1 hr, 47 min. 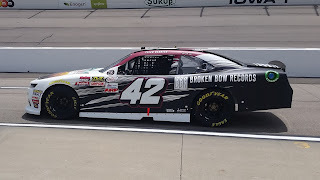 42 sec. 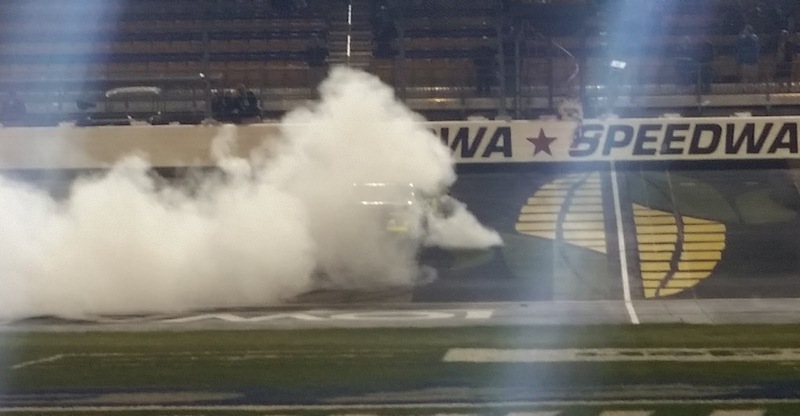 Margin of Victory: 1.62 sec. 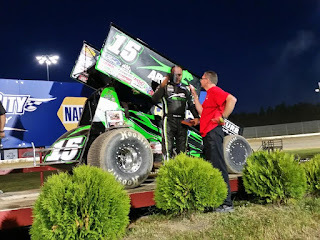 At Granite City Speedway in Sauk Rapids (MN) Donny Schatz #15 won his 11th World of Outlaws Craftsman Sprint Car series race of the year and he extended his point lead. Schatz has now won two of the three events held at Granite City Speedway. Jason Johnson #41 might have had the fastest car, he won time trials with a time of 11.572 around the .284 mile dirt oval at Granite City Speedway, not even close to the track record time of 10.720. 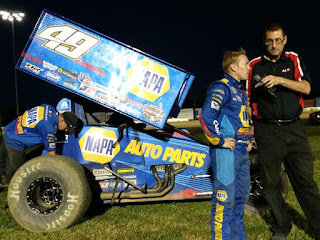 Johnson also won his heat race and the fast dash and he led the first 13 laps of the Main Event until a caution slowed the field and Schatz passed Johnson just after the restart. 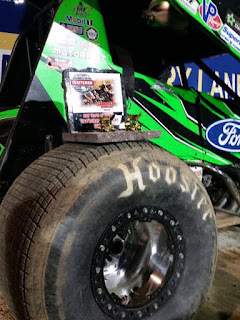 Schatz held back a few darting moves from both Johnson and #49 Brad Sweet to score the win and the $6000 first place check and the cool Granite trophy. Brad Sweet had a terrible time in qualifying, he was only the 16th fastest qualifier out of the 22 cars competing. 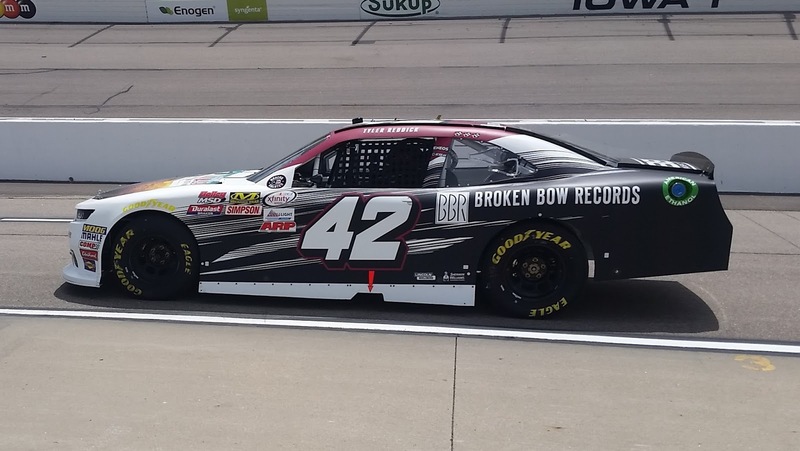 Sweet was a half second slower than Johnson in qualifying but his car was awesome in the main event. Sweet started the race 10th and moved up to the fourth position when the caution was displayed on lap 13, Sweet was able to charge up one more position and finished third, he also was the hard charger of the race. 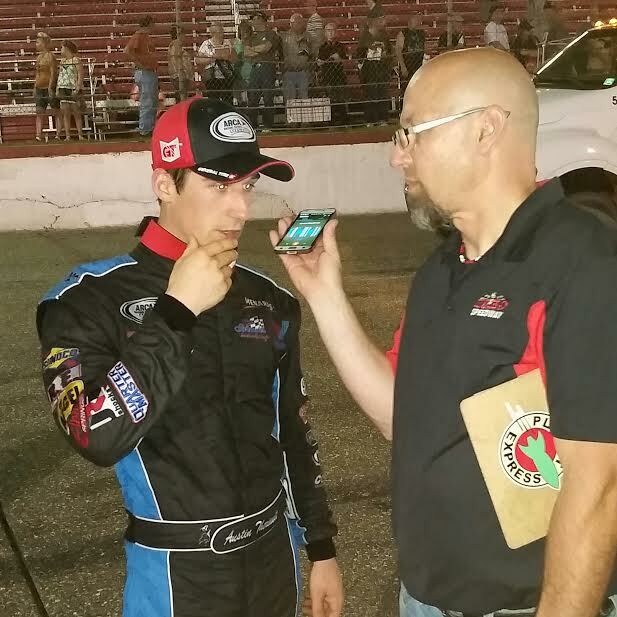 Here are our exclusive interviews with the TOP 3 finishers at Granite City Speedway. 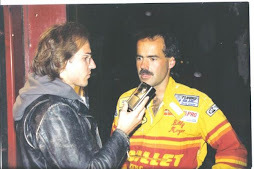 Click on the link for audio. 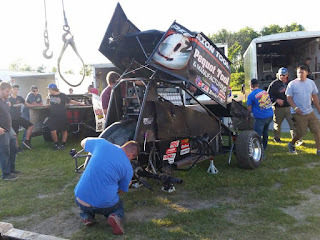 The only wreck of the night occurred during time-trials when #9 Jared Goerges flipped his car between turns three and four. 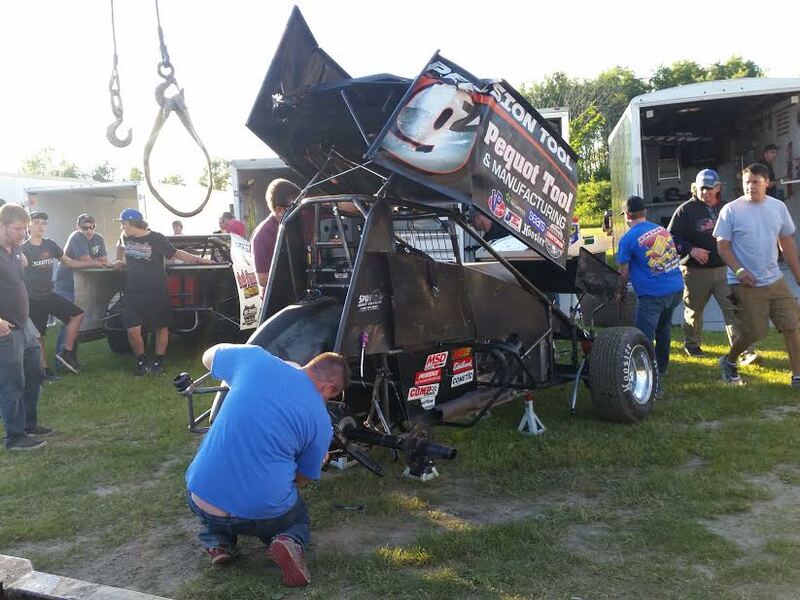 His crew worked feverishly in the pits to try and return the car to the track. 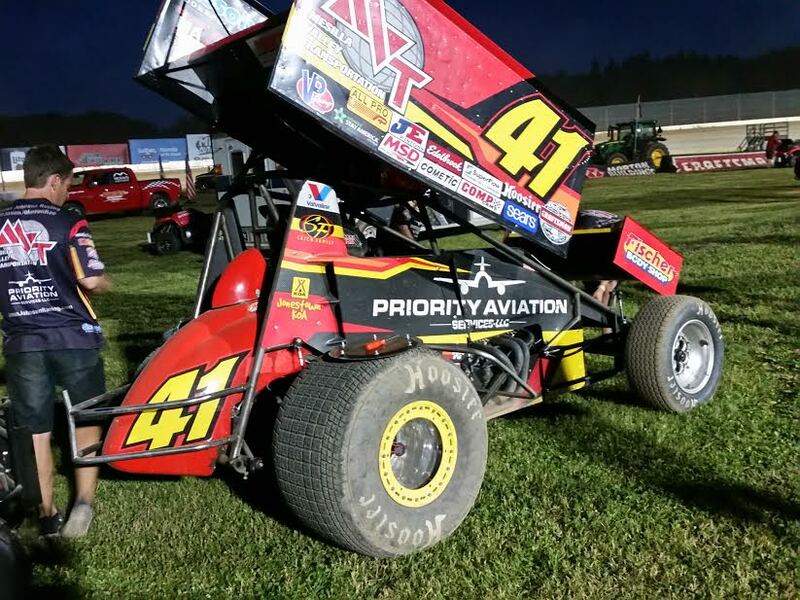 He did start the main event but ended up getting scored last place in the feature (22nd) after completing only one lap. 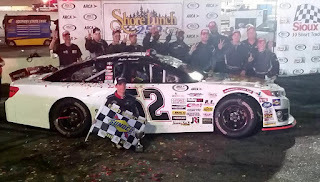 The finish of the Shore Lunch 250 ARCA series race at Elko Speedway was amazing. It ended with #52 Austin Theriault edging #15 Christian Eckes by just a couple feet at the finish line a margin of .029. Bret Holmes #23 finished 4th, he started the race in second with a time of 14.364, only .002 behind Herbst for the pole. 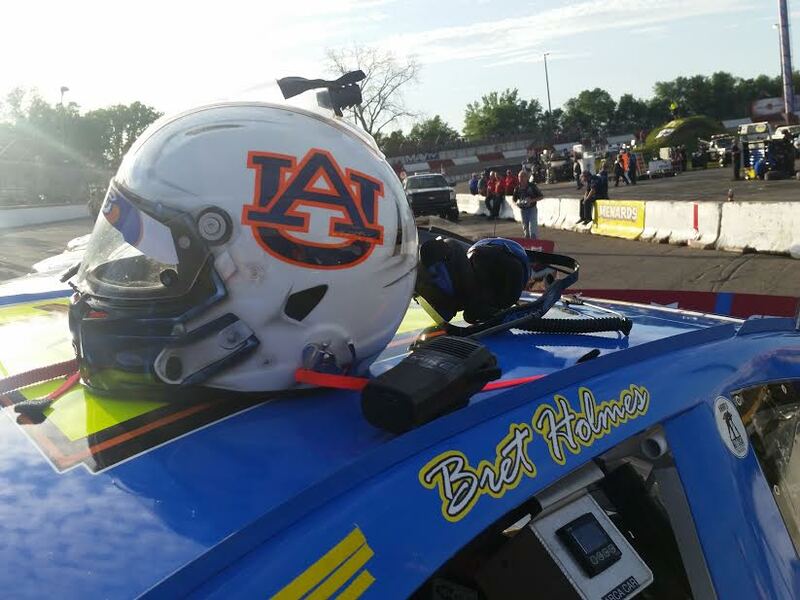 He is a student at Auburn and proudly displays their logo on his helmet. 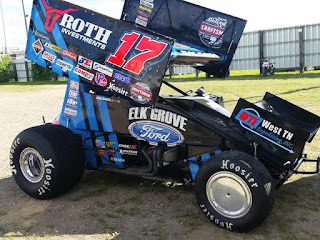 Local Minnesota racer #78 Cole Anderson (below) of Northfield drove for Mason Mitchell Motorsports, he had a very strong race and was in the "top 5" much of the night. 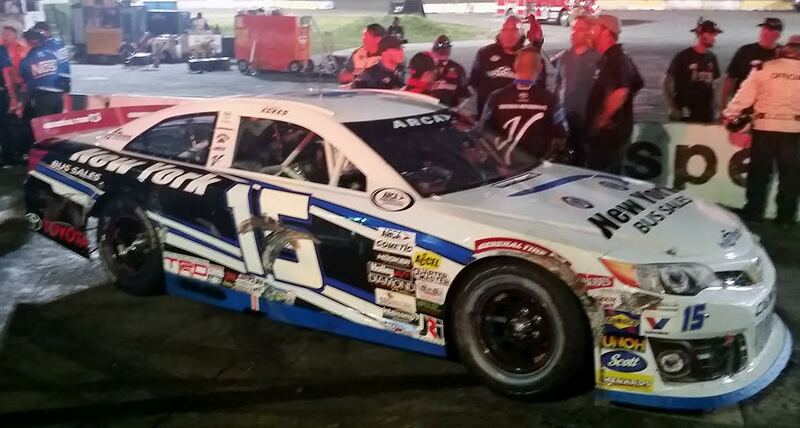 He was involved in the last lap wreck though and finished 10th. 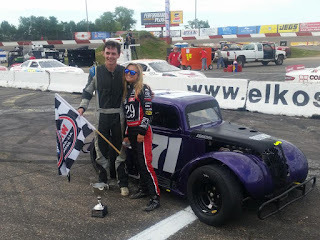 Another local racer Natalie Decker from Eagle River (WI) raced the #25 for Venturini Motorsports and finished a lap down in 13th after a pass-through penalty under green, she spent most of the race on the lead lap. 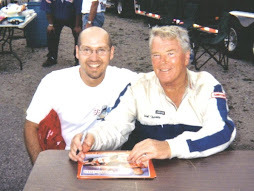 Decker did pose in a Victory Lane photo with Great North Legends winner Derek Lemke. 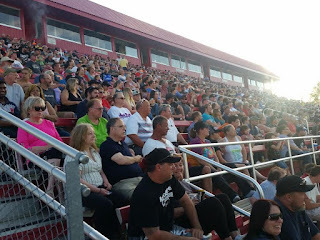 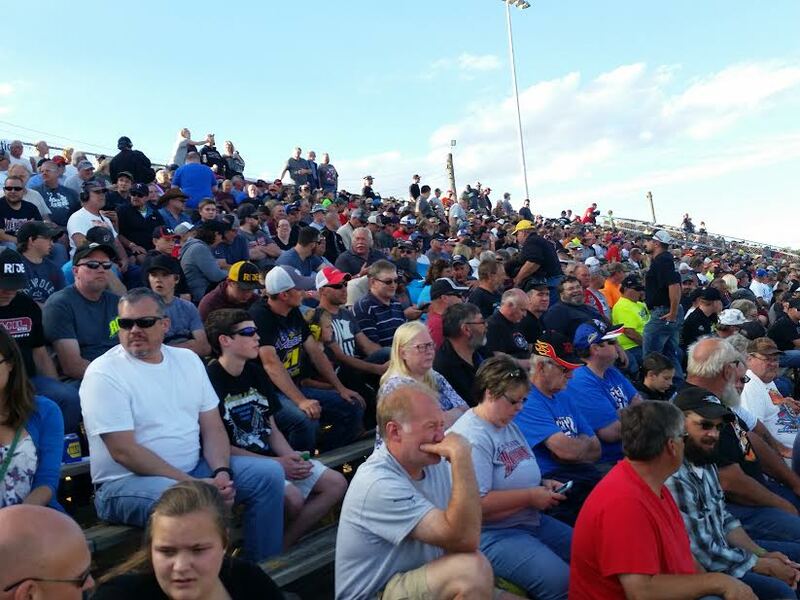 What an incredible night of racing and a good crowd at Elko Speedway for the #ShoreLunch250. For more coverage of this event and all MN racing listen to Speed Talk on 1360 Radio Saturdays 10-11am on KRWC1360.com or search KRWC on the free Tunein app for your mobile device.